While he was very cross and had no intentions of imparting great wisdom to me, he had given me the single greatest lesson I’ve ever been taught in life. Be a man. Be unafraid. Not that that meant I couldn’t be afraid, it meant to never let fear sway me. Even when I’m scared or worried, stand against the fear and be more powerful because of it. It’s something I’ve carried with me ever since that moment and I call upon it often in tough circumstances. It was one of the things that most helped me when my brother passed. I was the first to see his body, I took control of funeral arrangements, I called specific members of the family and made it clear that they weren’t welcome to the funeral, I was a rock for my family when they needed one and I would later breakdown quietly in my room. Someone has to be stable in moments like that and I was honored to do that for my brother, as he would’ve done if I’d passed. For the first time in my 31 years of existence I’ve finally come to a spot where no amount of bravery or courage can win a task for me. The last 2 years have been astoundingly difficult with multiple loses of family members, loss of religion, loss of relationships, and a massive shift in family dynamic, but it’s all been relatively easily traversable when taken with a heaping amount of pragmatism and a level headed nature. Now, I just find myself getting more angry and frustrated at a situation with which no good can come from. All options are a sure loss. The only question left to ask is: how much am I willing to lose? I apologize for being purposefully vague, but I have to be given the situation. To be clear, all is wonderfully well with my wife and kids. It’s just that these last few years have been extremely testing of my character, but this is the final one I didn’t need. The potentially largest blow coming when I’m already stretched thin. I finally understand the plight of the cat. Hang in there, dude. 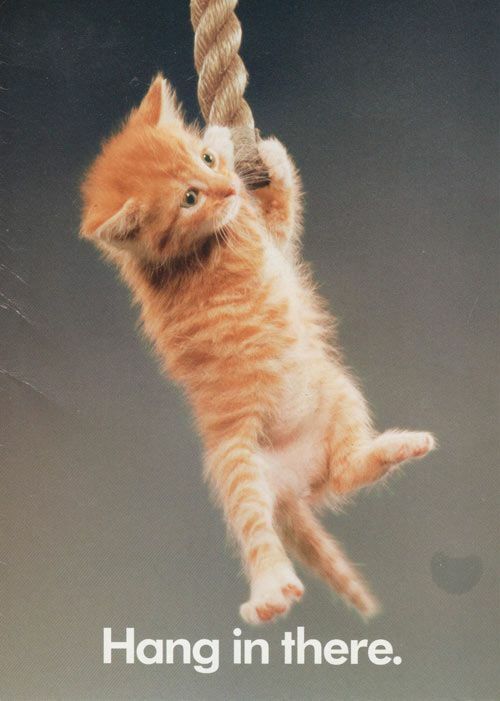 Hang in there.